I'd be remiss if I didn't include BYC in the name. I was lucky enough to find this site before I started construction. 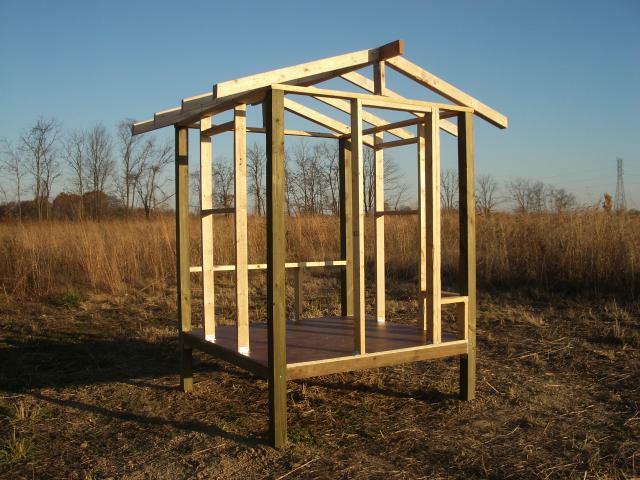 The coop is 6 x 6 by 6ft inside height. The run is 16 x 16. I insulated the floor, and walls with styrofoam, rather than to spend the big bucks for the good stuff. The ceiling is insulated with foil covered rigid pink foam. 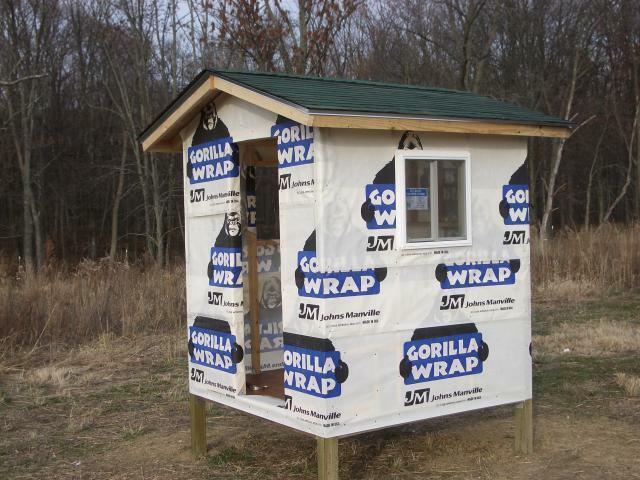 I bought minibarn sliding windows, and covered the outside with hardware cloth. The glass can be removed completely in the summer. You can see the vents in the top gables, and there also are vents in the soffits. Well, now I'll go back in time and tell you how I got here, and some of the mistakes I made along the way. My biggest mistake was the length of the corner posts. I ran them all the way up so they could be part of the framework. I would have been better off to have stopped them at the floor and then use standard 2x4 wall construction. The long corner posts created quite a challenge to maintain square angles. 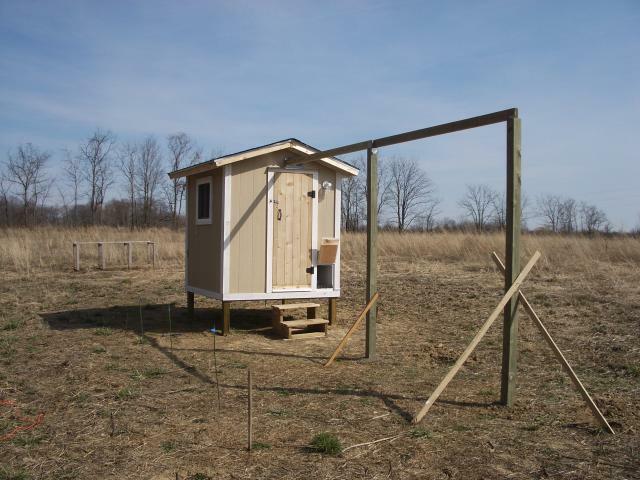 I elevated the coop about 18 inches off the ground. The chickens really love it under there when the weather is less than ideal. Most recommend a people door that opens to the inside. It didn't work for me and I had to reconstruct it to open to the outside. Relative to the size of the coop, the door would have opened inward to knock over anything I had on the floor (or hanging from the rafters). The main problem was that when it opened to the inside, the rain would hit the door and run underneath it. When I changed it, the door was flush with the outside siding and the rain just runs off the building. I completely encased the run with 1/2 x 1/2 inch hardware cloth. I dug out the sod and a couple of inches of dirt all along the perimeter before extending the hardware cloth down and about 2 feet out from the framing. I then covered it back with the dirt. 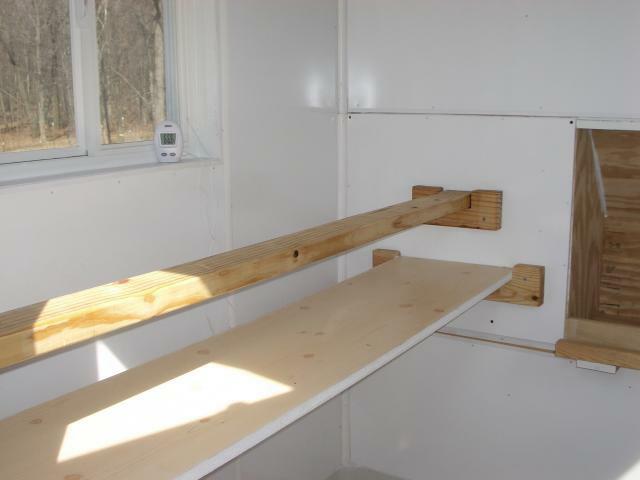 I have three perches attached to the center support beam, and added another made of a tree branch, in one corner. I used three logs standing on end instead of a ramp into the pop door. The steps into the people door are movable, so that I can clean underneath the coop with a rake. A couple of sections of corrugated roofing adjacent to the coop keep the entry from getting so wet, and give the chickens a place other than underneath to be outside, yet out of the rain. One of the best ideas I got from this site was to cover the dirt inside the run with about 4 inches of sand. I wanted to pour concrete at the base of the entry door, but I took the easy way out. I dug down about 6 inches, layed lansdcape fabric on top of hardware cloth, and covered it with gravel. In this way weeds won't grow up to block the door. I used shower board on the inside for easier cleaning. I installed a poop board under the roost and use the deep litter method. It really is surprising how clean the coop stays with only a daily scooping of poop into a bucket, and on to the compost heap. 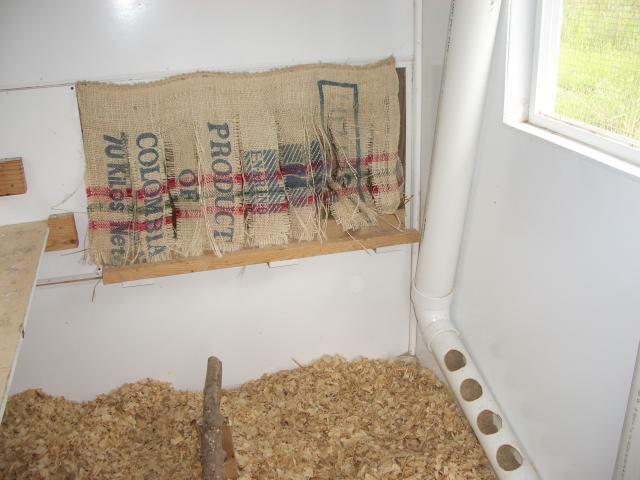 I installed modesty curtains (burlap bag strips) over the nest boxes, and built a PVC feeder (again an idea from this website). Notice I had to hang it at an angle for good flow into the bottom, horizontal section. I was lucky enough to buy a used Foy automatic door from a fellow BYC member (unfortunately for her, city regulations forced her to get rid of her chickens). It is great! 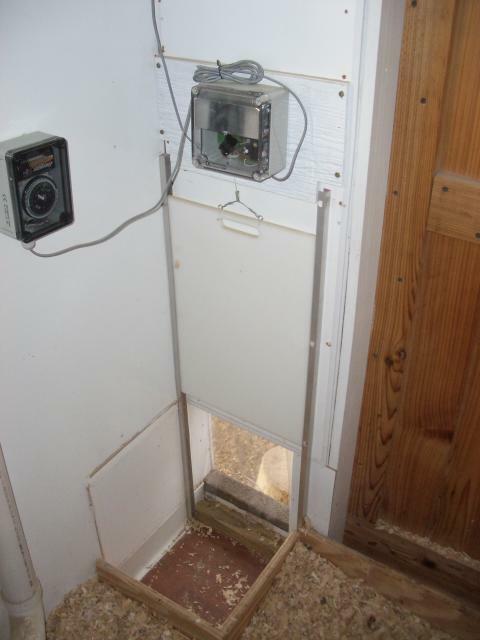 Notice how I had to build a box around the inside of the pop door entry to keep the litter from getting underneath the sliding door and preventing it from closing completely. Had I been smart enough to have cut the door initially about 6 inches above the floor, I wouldn't have had to do this. This photo also shows the cut out for a second pop door just in case I build an adjacent run someday. Finally, I'll show you the layout of my coop and run in relation to my second coop and the garden. 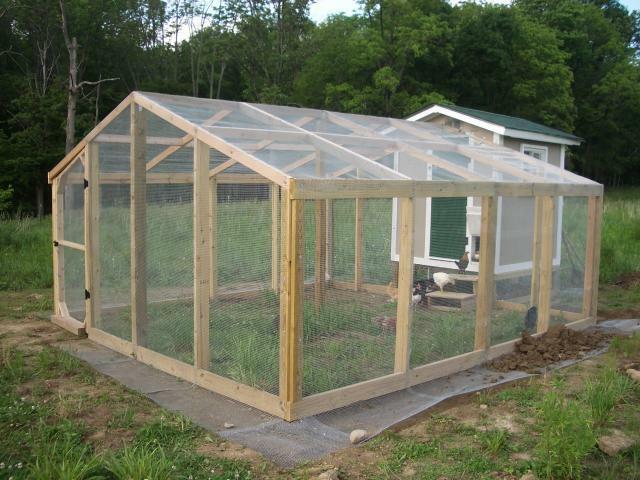 I'll use 2x4 in welded wire fencing 6 ft tall around the perimeter, and around the garden and orchard. There will be two strands of electrified wire around the outside, one 6 inches from the ground and the other at 18 inches. If you have any questions you would like to ask, don't hesitate to send me a PM. Kseale1986, chrisb01 and N F C like this. Nice coop, but that run is awesome! "Love the run space that they have"
You can NEVER have to much run space! If they are not free ranging they need alot of space to roam around in. Thanks for sharing. I would say that the run here has much more presence than the coop itself. The run also appears to be puppy proofed. No doubt that keeps the dog busy. What gauge of wire do you use for the run? We use a vinyl coated wire here at Horizon. wow that looks nice, how many chicks will it hold? And the run will stay in the same place. Right? How can I find the kind of chicks I want. Friendly.large non flying, med to large brown eggs? This is awesome! Was it hard to make the run?